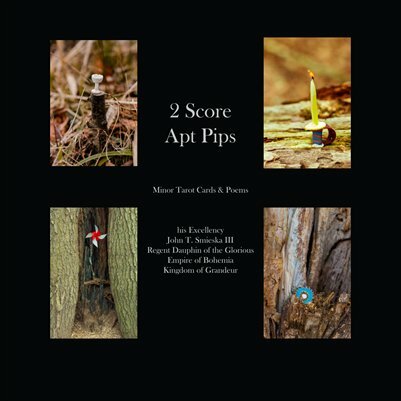 With original poems and photography by John Smieska (the Regent Dauphin of the Royal Empire of Bohemia, Kingdom of Grandeur), this book covers the pip cards (numbered cards one through ten) of the Tarot deck in four suits. There is an emphasis on Nomadism (as defined in the Deleuzian terms), with each poem providing a divinatory meditation and a photograph for each corresponding card in the Tarot deck. The resulting product thereby serves as a moveable, spontaneous, and Nomadic (rather than linear) work of literature, commentary, bizarre magic, and/or performance art.